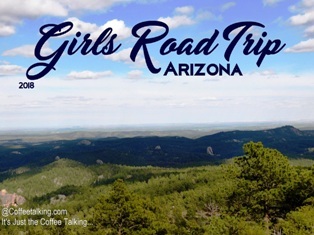 Over the past month I've posted about our Girls Road Trip 2018 - Camping and hiking across Arizona and then hiking in Arkansas. There are many times I wanted to photo a certain photo I had in mind but at the time, looking through allllll the photos, I couldn't find it, didn't see it, didn't have time to keep looking, or got side tracked and uploaded other photos.... etc. This morning I have no theme for a post as I'm done featuring the trip - so I just just randomly went back and chose photos to post. I know when I was looking online for ideas and information about the area in my planning, I loved seeing blogs with random photos. I got a feeling for the area and what to expect. That's what this is I guess. I'm sipping hot, strong coffee and just choosing some random photos of the Grand Canyon area of our trip that I don't think got featured in other posts yet. Remember that solitary little rustic cabin in the woods we were staying at during the last couple days? Right before our turn off to get to the cabin, we saw this warning sign on the road... well that was unexpected! Mountain lions are the largest predators found in the Grand Canyon. There are 18 native South American, 25 native North American, and 40 English names for this species, and the most common are puma, cougar, panther, and catamount. Humans in Grand Canyon have no reason to fear mountain lions because they do not see humans as prey. For mountain lions, being hit by cars is a common cause of death. Please use caution when driving, especially on East Rim Drive. This is a 'Where's Waldo' of sorts - but easy if you look. Love this view from the Desert View Tower because you can see the river so well! The colors are just amazing as well; so beautiful. In many areas the tourists just stuck to the main 'focus' in that area - and at most of the outlooks they would arrive, look, take a few photos and leave. We went off the beaten path at most of them and did a little bit of hiking - so even though the area is quite busy with tons of people around; many of our pictures just show us as we always liked to do some walking in the areas - not just arrive, snap and leave. One of the gift shops outside of the main park; I believe this one might have been near Desert View. It featured a lot of local artists and was a smaller scale than the commercial items available inside the main park. I mentioned the shuttle buses in the park previously; they like to use the buses to cut down on traffic and vehicles in the park as the park was never made to accommodate the number of visitors it receives today. The buses run on colored lines; just pay attention and use your maps and they are easy to follow. Hance Rapids - we would have loved to have done a few more excursions while were there but our schedule didn't allow it. But at one of the lookouts you get a great shot of the rapids (although from this distance of 3.8 miles away, the water looks calm doesn't it?). There is a sign at the lookout explaining the power of the rapids. It's one of the Grand Canyon's most hazardous rapids, as the Colorado River falls the height of a three-story building. 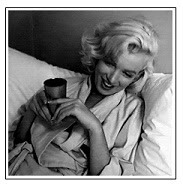 My coffee is gone - it's time to fill up my cup! Thanks for stopping by Coffee Talking! In January and February, when I was planning out our camping and hiking trip, I needed to find a place to sleep in Arkansas - on our route home. I have no idea how I stumbled upon it, but I found White Rock Mountain and saw the photos of their rustic cabins online and decided to 'splurge' and stay in the cabin as it had electricity, water and a bathroom... things we never had all at once this entire two week trip! It was going to take us all day to arrive there, but the pictures I saw online of the hiking in that area were gorgeous, so I booked 2 nights. The first was to arrive and sleep and then the next day would be for hiking, resting that night and taking off early the next morning to drive home. In the end I loved that we did this - but the photos online were a little deceiving! But using all three plus watching for signs (when they finally posted any!) we found our way... sort of. The other thing that was crazy was the roads were probably the worst we drove on this entire trip - and we drove on some terrible, horrible, awful roads in Arizona when we were on random 'forest' roads in the middle of nowhere. These were terrible. I sometimes had to go about 4 mph as there were not just 'rocks' jutting up from the roads, but some were almost a foot tall. Bumpy with rocks and holes; even if you had a truck, if you valued your tires staying inflated you wouldn't have gone over 10 mph. You could tell the road had been literally washed out in many places - and never repaired. It was a nightmare. (We found out later it was allowed to get THIS bad because they hadn't grated it this year in anticipation of putting in a bunch of drainage pipes - which we saw lining the sides of the roads). We seriously thought we were on the wrong roads because how could a road THIS terrible and unusable lead to a public recreation area with camping and cabins? Right? It did. By now I think they should be finished putting in the drainage pipes and have grated and re-graveled the road, so I'm sure it's probably much better. The cabin looks SO AMAZING in these pictures! I know!!!! But they aren't what they seem. Very pretty and rustic but they are so unloved. They are incredibly worn, infested with mice and spiders and insects of all sorts (millipedes, cave crickets, bugs I have no names for). The doors don't fully close without gaps so you can't keep them out and if you have a fear of spiders, I just don't think this is the place for you. (I went into the kitchen during the night and wowza... about 10 different insects/spiders/things on the floors and cupboards... the bathroom is the same so we just 'watched' the 5-6 different spiders and insects and kept an eye on them while we did our business... making sure they stayed put while we were 'busy' and didn't jump or crawl on us). Honestly, pitching a tent outside would have probably netted us a much better sleep... but we still love love love these cabins. If they were fixed up, roof holes, gaps in the walls, etc mended, (and sprayed for spiders and bugs), I would even love to purchase one as a get-away home. They are just so beautiful and you can tell back in the 1930's when they were built, they were built solid and sturdy. It's just that there hasn't really been any upkeep since the 1980's. There were so many spiders that we put our hair in ponytails and braids and then hunkered down into our sleeping bags and actually used the rounded head portion of it to cover our heads and pulled the elastic string to secure it in place so no spiders and bugs could crawl into our long hair and get tangled while we slept. It was hot... oh so hot... but it was spiders or sweating; and we opted for sweating. The mice in this cabin are brilliant. We are seasoned campers and know about hiding away food and not having food smells, crumbs etc. could climb on. It found it. it INSIDE the tote and got into our one bag of little Combos snacks. The view out the back door is amazing - and one of the trails literally leads right out from the door. When we first arrived it was pretty late in the day so we went on a short hike, then turned around and came back to the cabin to make dinner and try to sleep. The two nights we stayed, every time I wanted to sit on the back porch and just enjoy the view (or coffee), I was constantly finding ticks on me. It was crazy because there were no trees directly overhead and no shrubs or bushes or weeds up against the cement patio we were sitting on! But sure enough; ticks found me! The trailhead starts right outside the cabins and there are 3 different trails that all connect at some points; allowing you to go as far as you wish. We ended up hiking about 4 1/2 miles, then turning around and coming back 4 1/2 miles for a total hike of 9 miles that day. The hike would have been easier had it been fairly flat but it's not. It was pretty easy going for the first 3-4 miles but coming back was especially difficult because you are already hot and tired but it's steep inclines and much of it is uphill. Just keep swimming... just keep swimming... swimming, swimming (Dora) became a "just keep hiking, just keep hiking, hiking, hiking...." motto. One of 3 different motto's we used to keep going even though the heat and humidity coupled with the steep inclines were tough. be done with our 9 mile hike! It was time to bid adieu and get back on the road! And thus ended our Girls Road Trip 2018. You'll see these in many photos of us on this trip. This pack was an afterthought - and wow! LOVED IT. My daughter loved it so much you will see it on her back in all the photos of us hiking or touring 'out and about'. Folds up into it's own little pouch when not in use. Not one bad thing to say about it; no matter how much we put in it, it was comfortable. These boots! I blogged about a different pair (same brand) I bought 2 years ago and HATED but I decided to give these a go. I love them so much. My daughter ended up getting same ones as I did. When I bought these, I didn't think I'd care about the rounded head part - but it ends up - when you are sleeping in an area with tons of spiders, putting your hair in a braid or pony and then tightening this around your head a bit, really does help you sleep more secure knowing spiders won't be crawling into your long hair and getting tangled during the night. I like to order the best seller kits; but whoa - watch prices! The same exact kit can sell from $30 to $60 depending on supply and demand and Amazon's tracking cookies on your computer. We made sure to order TWO cases of the biscuits and gravy because love them that much and also a whole case of chicken breast and mashed potatoes. These trekking poles were something I bought not knowing if I'd use them or not. I did end up using them quite a bit hiking in Arkansas. They collapse to a good pack size but are sturdy when pulled out to size. This is a post I intended to make even before we left for our camping and hiking trip but life threw us a lot of curve balls before the trip and I never got around to doing it. Even now this isn't the kind of post I intended and I'm just slapping it together quickly by literally looking up my purchase history and linking to the page of items I bought. This list are things you will see in various photos of our trip (if you've been following the posts). I feel a little guilty about the fact that a good portion of our camping gear came from Amazon; because I do like to support other stores that sell gear - no matter how big or small; I like to see all retail thrive! But to be honest, when I do my research, if Amazon has the exact item I need, at the best price - that's where I'm going to get it. I can't afford to spend $70 on something when I can buy the exact same item (literally) for $56. When you are purchasing multiple items you save a huge chunk of change. So many of our items come from Amazon although I also bought from Lowe's, Walmart, Sierra Trading Post, Tractor Supply Company, Sam's Club and a few others. However, because it's a pain in the rear to link to all these items, I decided to just put the Amazon links here for two reason; the first, because I'm an affiliate of course, but second - as everyone knows, Amazon keeps a record of all your orders so it was nice to simply go back to through my orders, skimming for the items I bought for camping and then link to them. Much easier than searching for hours to find the exact item I bought! This collapsible sink was awesome! Only about 1 1/2" thick when collapsed, it made washing dishes so easy, yet took up almost no space. We used these in our collapsible portable toilet - because the double doodie bags that are sold to use with it are so expensive. These waste bags are for pets but worked great in our portable toilet! Large enough, and thick enough we could use them for 2-3 'visits' before removing it - and no leaks or rips. This is the kind I originally bought about 3 years ago as an 'add on' item at Amazon for $2.12. I loved them and went to order more later and they were about $6. Supply and demand I guess. But I still bought more. I chose this one when I needed one more set of eating utensils and liked the big, round spoon that comes with this one because it works great as a stirring spoon and serving spoon while camping and hiking. My favorite mess kit! I liked it so much I've bought two for 'camping gear' gifts for others in addition to the ones we bought for our own family. You'll see these in the photos of us in the cave but my daughter is wearing them almost the whole time - even more than she did her hiking boots. This solar shower isn't in any of the photos. Long story, but in the end, we didn't use it. This! Something I never would have purchased in years prior but did this year and what an awesome, awesome thing to have! Having our own private little bathroom was something we came to appreciate more than I ever thought I would. This is a combination solar shower OR wet/dry bag. LOVE THIS but we only used it as a bag on this trip; not as a solar shower. For kayaking, boating, etc. this bag rocks for keeping things dry or carrying water. We used these a couple times with the portable toilet but we mostly used the biodegradable pet bags I linked to above. These are great but they are expensive. We had a variety of freeze dried foods - a lot of Mountain House but also supplemented with other freeze dried foods I bought in a can and then vacuum sealed into smaller portions. This camp stove has been SUCH a great investment. Another item I refused to buy for years - because camping is about cooking over a fire, right? I was an idiot. I love this and it makes brewing coffee fast and easy as well as cooking meals of course. Best yet? Works with propane OR butane! I ended up buying 3 of these because I really liked them. I didn't think I'd care about the rounded head part - but it ends up - when you are sleeping in an area with tons of spiders, putting your hair in a braid or pony and then tightening this around your head a bit, really does help you sleep more secure knowing spiders won't be crawling into your long hair and getting tangled during the night. Oh! But note it is NOT good for keeping you warm if it's under about 50 degrees out. Line it with a fleece bag or blankets. These trekking poles were something I bought not knowing if I'd use them or not. I did end up using them quite a bit hiking in Arkansas on the way home from Arizona. They collapse to a good pack size but are sturdy when pulled out to size. This is the Stanley cup set I have mentioned on Twitter a few times! It's NOT fun to use for cooking thick meals in because it's a pain to clean out as it's so deep. But it's GREAT for liquids, soups and coffee. And the 2 cups it comes with inside are my go-to coffee cups for every camping/hiking trip. If I didn't have room for my other mess kit (above) and could only bring one kit - THIS would be it for everything. Foods and drinks. These are not available from the seller I bought them from but you can see what I bought and they are available from a LOT of other sellers. They work great and are still going strong after many trips... the batteries haven't even needed to be changed yet. Love this mat. Although supposedly 'self inflating' you'll be happier if you help it out a little and blow. Once it's inflated it's super comfortable and wider than many on the market so you don't slide off. This is the toilet I've mentioned probably too-many times but we were so thankful for this thing! We camped in the national forest and desert quite a bit on this trip and it was so great to have this with our portable little pop up tent, disposable bags and the 'poo powder' you'll see below. Although it's called 'poo powder' it doesn't do too much for poo right away but it might if it was left long enough. What it DOES do is cut down on the smells and it instantly gels up liquids! We would get our portable toilet ready with a new disposable bag and a scoop of this powder in the bottom. When you go to the bathroom it would gel up the liquids and counteract any smells. This made tying off the bag for carrying and disposing so easy. For "number two" it does help with smells but we never left a bag in place more than 1 day so I don't know what 'break down' effect on poo it would have or not have. For urine though (and liquid vomit I imagine) this is GREAT. A good investment! Our power inverter came from Lowe's. The deep cycle marine battery I used with it was from Sam's Club. The folding cots were from Sierra Trading Post. The cots were great good (one was broken when it arrived and obviously was sold to me broken as it was returned by someone who broke it trying to put it together.) I probably wouldn't order from Sierra Trading Post again if could find the same item(s) elsewhere for a similar price.